I despise people who blog on subjects they know nothing about. But here I am, all ready to blog about Adele. Mercifully – for you – it won’t be long. I’d been wondering about Adele for a bit, having worked out she might actually be someone I could like, while also being someone I knew next to nothing about. So the fact that Swedish television seems capable of showing programmes other than stupid reality competitions on a Saturday night, meant I had an hour of Adele, Live at the Royal Albert Hall I could watch. To put it briefly; I liked it. Her. I often don’t like music when I hear it for the first time, so I’m glad it wasn’t like that. I liked it immediately. And my relief to find that a woman is able to sing, and to do it well, while also being fully clothed, is considerable. I mean, who’d have thought? Adele even looks like she’s eaten food recently. And still she can sing! It’s been a while since I was at the Albert Hall, and let me tell you, back in those days it would have been impossible to have everyone there waving telephones around. But it was most effective, with those lights shining like stars, and all for Amy Winehouse (who I also know nothing about). 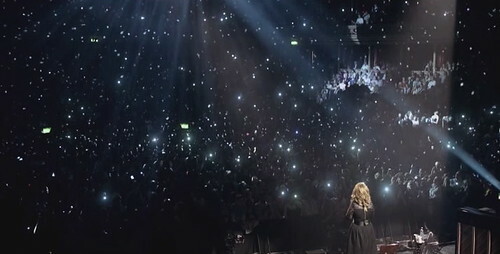 You can’t blame Adele for needing to wipe her eyes, and it must be so fantastic getting the audience to sing, word perfect and in tune, almost as if they had rehearsed it. With television cameras in the Hall, you could see that Adele’s fans sang along to all the songs. 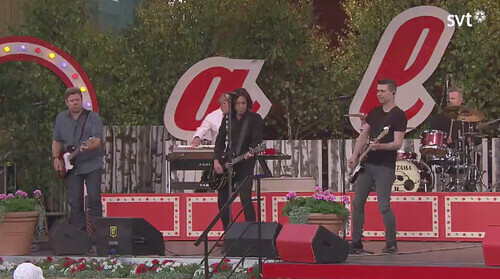 I suppose I feel a bit left out, as I couldn’t sing with them. But maybe my time will come. It’s funny how you tend to watch different things on television when you’re on holiday. And I don’t mean because you are somewhere else and different things are offered. Is there anywhere that doesn’t give you Midsomer Murders and Foyle’s War? It’s been a long time since I gave up on Midsomer Murders in Britain, but almost caught the ‘Swedish’ episode last night. I didn’t, simply because it was after Allsång på Skansen, and I wanted a break. 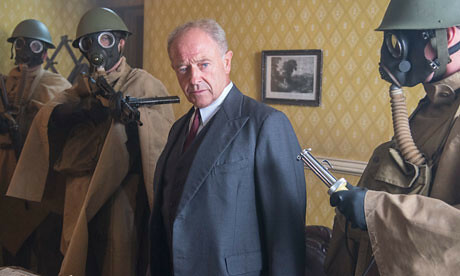 This evening I gave Foyle’s War a go, as we really needed to watch something – anything – after a whole day of rain and cold. I’ve not seen that for a while, either. Mostly due to conflicting programming. I like Miss Pierce, and I love Sam. She reminds me of someone, and after ten years, I am still wondering who it might be. The new ‘series’ looks promising. It’s not in Hastings, which is a shame. And it is hardly a series. Three episodes might, at a pinch, qualify as a mini-series. On the other hand, three episodes can be fitted into a holiday. And I might be spared another viewing of The Party on video, now we’ve ascertained the video player does work. If the Stones can play Glastonbury, then Gyllene Tider can play Allsång på Skansen. I put the laptop in front of the television, so it too could watch Allsång. (Actually, it was a feeble attempt to make it possible for Daughter to watch from afar. Via Skype. But it didn’t work.) I had to enjoy Måns Zelmerlöw all by myself, and couldn’t help wondering if his prattish fall off the stage was a re-enactment of an earlier, genuine fall. He didn’t seem to enjoy it. 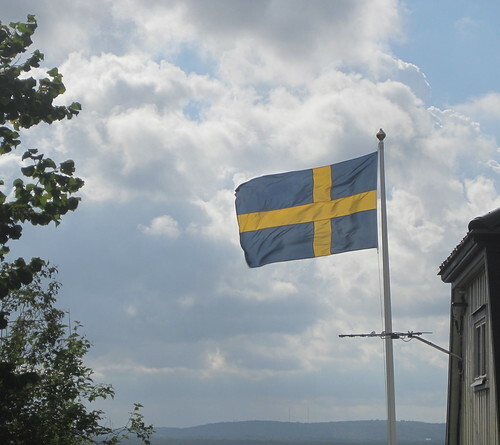 We had a choir, and we had a brand new 15-year-old, Zara Larsson. She looked so nice that I sincerely hope she won’t be as successful as Carola who came after her, wearing a dress worthy of some US television star. She has been around for so long – 30 years – that her old hits are now Allsång songs. I’m always struck by how everyone sings at Skansen, and how they seem to enjoy themselves. No one is too cool. 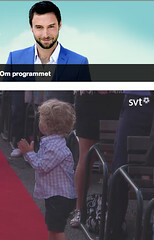 By getting up at the crack of dawn, you too could sing live – and out of tune – on Swedish television. And one of these days I will not find the word ‘husband’ strange when I see it rolling in the credits. It means ‘house band’ so means backing musicians. But I suppose a husband comes in handy for all sorts of things. She said she might go to a concert the next evening, as one of her friends at uni plays for the G and S society there. I said that sounded like fun, and directed her to YouTube for some musical samples. When she found they were ‘responsible for’ The Elements Song, she decided it might be all right. Then when the Resident IT Consultant and I were doing the wine and water thing at the Bridgewater Hall on Saturday afternoon, we looked at our programme and I remarked that some G and S would have fitted in nicely. The Resident IT Consultant (who consults facebook for everything) said that the concert Daughter had mentioned was to fund a trip to Buxton, which for us felt strangely close to home. That’s when the lady across the table from us said she could tell us the date. Which was strange. We thought she might be from Buxton. But no, she was just the most ardent G and S fan, and she knew whoever was running the concert Daughter was going to. She went. I received a text to say she was the youngest in the room, and that it was ‘the church hall lunch’ all over again. But I couldn’t help noticing on facebook that she was enjoying the concert. Perhaps old people aren’t totally hopeless after all? The Countess of Wessex wasn’t with us. She came a couple of days ago to listen in on the rehearsal. The Hallé now have their brand new rehearsal venue all ready to use. We, the cost-savers, had come for Saturday afternoon’s Promenade concert Beside the Seaside, Beside the Sea! conducted by Stephen Bell and presented by Alasdair Malloy, with angelic singing by the Hallé Children’s Choir. The audience was an unusually young one, so coughs were not as ‘stifled’ as the programme requested, but who cares? They are the future of the Hallé. We were treated to a selection of watery pieces of music, starting with Portsmouth Point by Sir William Walton, and then Khachaturian’s Adagio from Spartacus. He was so wrong, that Khachaturian. The piece simply oozes water. The Onedin Line people knew what they were doing when they chose it. Then the choir sang about a trip to Blackpule (Blackpool, by Chris Hazell) and did a fantastic job of waving and being sick (pretend only). Debussy and Britten followed, before a selection of postcards from the wind and percussion sections. It is so nice to see more of the individual orchestra members! My Bolero hero (hey, that rhymed!) played An der Schönen Blauen Donau on glockenspiel. The tuba player played from Brahms’ Hungarian Dances, although he didn’t actually dance while doing it. (I only mention this because I have seen it done. And I like it.) One of these days I’ll get my tubas sorted from my trombones, too. New York, New York had most of us clicking our fingers. The choir clicked especially well. Elgar’s Enigma Variations brought the first part to an end, allowing the musicians to ‘come out and play’ with their children. It was a sort of family afternoon. Luckily baby Carrillo-Garcia didn’t regurgitate (sponsors) Vimto over daddy’s white jacket. George Fenton’s music for The Blue Planet on television featured a great big whale, and you could literally ‘see’ the whale in the music. Just as the little plasticine men from The Pirates! In an Adventure with Scientists! were quite visible, if you listened carefully to Theodore Shapiro’s piece from the film. We clapped so well after all this that we got an extra, with much cheerful booming from the horns. Audience, and choir, participation required lots of arm waving. It doesn’t matter if babies cry. I think we all enjoyed ourselves, and I imagine that quite a few children will want to return. It was good. And afternoon concerts mean you’re not too tired afterwards. Even with audience participation. We drove to Scotland a couple of weeks ago. We mainly seemed to travel the scenic route. Scenic is nice. Driving through Fife we didn’t come across all that many places to stop for tea, even though the beautiful countryside was screaming out to be allowed quaint tearooms all over the place. But we found one, where and when we wanted it. Turning off in Auchtermuchty we noticed a sign for the Tannochbrae Tearoom. Very Dr Finlay. Auchtermuchty was possibly the sleepiest little town I’ve ever stopped in. But it said Open on the door. The light was on. The door was, however, locked. But after a fair bit of pulling (nothing will stop this witch from her tea and cake!) a man appeared from round the corner, with the key, letting us in. Not much had changed since the days of Dr Finlay, I’d say. And it was quiet. Did I mention that? We had tea and coffee, toasted teacake and lovely lemon and lime cake. With cream. So that was all right. On our way south going home, we left the motorway for elevenses in Lockerbie, where the Resident IT Consultant has found a popular little town eating place, the 91 café. It’s friendlier than a service area and has home baked cakes to eat with mugs of tea and coffee. It’s nearly always full, which is as good a sign of worthwhileness as any. And then, we needed somewhere to eat our lunch sandwiches a little further south. 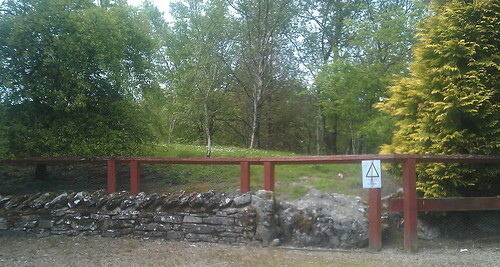 Time-wise Killington Lake Services was a good place to stop, and I knew they had a picnic area. Somewhere to sit and look at the lake as you munch your home made cheese sandwich. It would have been nice to look at the lake. It was there. So was the weather. It didn’t rain. It wasn’t too cold, or too crowded. We just didn’t feel the lake view was conducive to enjoying any kind of lunch. You’d think that perhaps the effect of Monday morning after a busy weekend could have caused the non-emptying of the bins. Not an excuse, but a possible explanation. But all the other bins, in the car park and near the shop and café were nice and empty. I hope they weren’t trying to put people off eating ‘for free’ in an attempt to get us to go in and spend money. If they weren’t – and they ought not to – they should have better staff guidelines on what needs doing, and when. A little reminder that the picnic area might be overflowing in an unhygenic way. 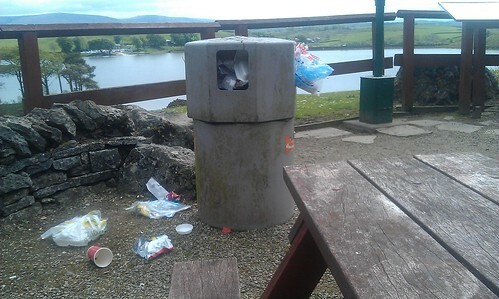 And who on earth thought that putting the bin between the table and the lake view was a good thing in the first place? There was a perfectly serviceable corner at the back.